Now more than ever before, the choices we make about how and where we sleep impacts our long-term wellness. This elite product brought to you by Zenus is more than a mattress – it is easily the most sophisticated sleep system on the market today as it addresses each of the four key factors that interrupt our need for a full and restful night’s sleep. This innovative system is made from only the finest materials and adapts to the shape of your body in every position, keeping your spinal column in perfect alignment. This makes it perfect for the back, side and stomach sleeper while its special foam promotes ventilation, keeping you cool in the summer and warm in the winter. Featuring a state of the art “EMF Silver Shield,” the luxurious Ultra Tech Silver Collection eliminates harmful EMF radiation from TV’s, cell phone chargers, computers and even the power lines in your walls. You can even add an optional grounding system that helps neutralize free radicals to give your body the rejuvenating rest it deserves. What differentiates Ultra Tech from other elite sleep systems? This orthopedic sleep system has been uniquely designed from its inner core with two layers of Elio-cell foam in two different densities which shape to the human body. Its special foam also promotes ventilation, keeping you cool in the summer and warm in the winter. The Carbon Fabric that surrounds the entire case, along with the Electromagnetic Silver Shield™, which protects you from harmful electromagnetic fields. The latest non-toxic, laboratory tested durable fire retardant layer. You can rely on its flame retardant to provide safe protection for you and your loved ones without off gassing or subjecting you to dangerous chemicals. Proprietary Carbon Fabric encases the entire core of the mattress to provide the highest level of protection. Its Silver Shield gives you the same healthy grounding effect that Mother Nature does if you were to walk barefoot on the beach. Just plug it into the grounding contact in your outlet and the Silver Shield will protect you from the unhealthy dangers of electro magnetic waves, reducing stress and giving you a deep restful, invigorating sleep. The Ultra Tech Silver Collection delivers all this and more! Air ventilation channels making it breathable. Silver weaved removable, washable, replaceable cover. Adjustable Ultra Core mattress and pillow. Protects against dust mites and bacteria. Evenly and uniformly supports your weight. The mattress core does not sag. Does not transfer your weight to partner. No toxic off gases or odors. Delivered fresh, pure, sealed and bacteria-free. Sleep with confidence backed with a 21 year warranty. 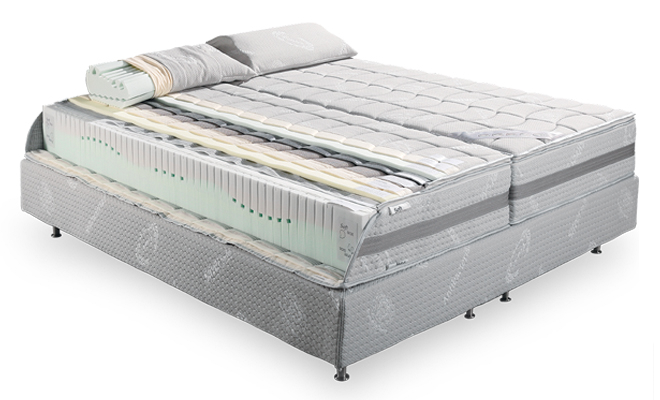 When you want the perfect night’s sleep, get your own Ultra Tech Silver Collection. The BioMat Queen lies on top of your home mattress. Some like it hot…Some like it cool…The Dual Control Panel allows customized heat and time settings on each side of the BioMat. It converts electricity through an EMI device (Electromagnetic Interceptor), which then passes through a computerized control panel with 9 variable heat settings, into Far Infrared Rays (FIR), and Negative Ions. These two components, Negative Ions and Far Infrared Rays, are transferred through Amethyst Quartz channels which cover the entire surface of the BioMat. Amethyst also produces naturally occurring far infrared waves. These frequencies penetrate 6 inches into the innermost recesses of the body, stimulating the healing process. This Supports the Immune System and aides the body in reducing inflammation, increases blood flow and tissue oxygenation and promotes relaxation and a restful sleep.